It is rare for a book about law to hit the best seller lists. It is even rarer for a law book to have merchandising. The Secret Barrister’s book, however, has produced a limited number of T-Shirts. To raise money for the Billable Hour charity. 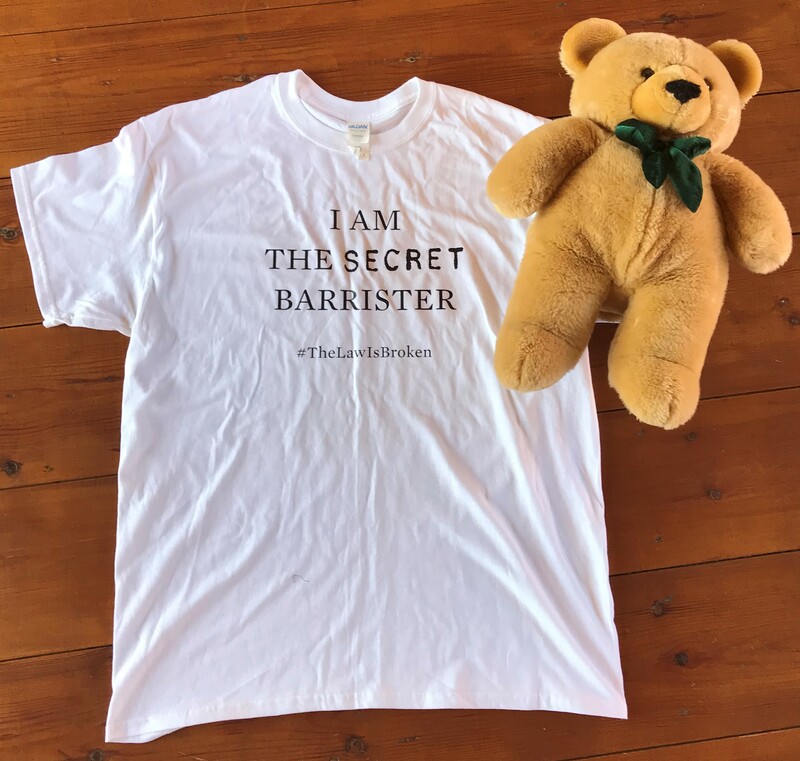 I am offering a chance to buy a unique Secret Barrister T Shirt. This shirt is unique in that it will signed by SB themselves and then (to be sure it is perfect). ironed by one our eminent QCs. There were only 50 T-shirts made for the Vigil for Justice on the 18th April. They were available to the first 50 people to attend. Somehow, despite there being a few hundred or people there by the time I arrived, I was deemed to be the 50th. This shirt is unique. Everyone else was wearing their T-shirts. This one is pristine. (Size large. The bear is not involved in the auction but is for illustrative purposes only). To make it really unique SB has agreed to sign it. Given the issue of anonymity this is likely to be by way of a rabbit’s paw (& perhaps a friendly greeting). (This is being arranged via SB’s kind and helpful publishers with the agreement of SB). After commenting that the T-shirt look creased James Turner QC accepted my invitation to iron the shirt before it is dispatched. (There will be photos to prove this is done – James has a background as a professional ironer). The winning bidder should pay their winning bid as a donation to the Billable Hour charity. Once payment is confirmed it will be sent to the publisher, SB will sign it and then James will iron it. You can bid via Twitter. It is on the hashtag #SBTSHIRT. You can bid as much as you want, as many times as you want. If you want to bid secretly send me a DM. If you don’t have access to Twitter – ask someone who does. Bidding closes at 11.45 pm on Monday the 23rd April 2018. The highest bidder will be sent the T-Shirt once the payment is confirmed (via the publisher and the ironing QC).